Today was St. Patrick's day and we talked about St. Patrick's day and what they do on this day in Ireland to celebrate it. We then had a puppet show and showed them a shamrock leaf and explained to them that if you find a four leafed shamrock, you will find a pot of gold. The kids were very curious about this and laughed a lot. We then sang the "Rainbow song" and after this had a shamrock hunt. Next we had a snack and after this we went outside into the warm sun and played jump rope and kicked a soccer ball around the yard. We then came inside and played musicaｌ chairs and hide and seek with the kids which they thoroughly enjoyed. After lunch some of the kids made some nice green bracelets or watches to symbolise St. Patrick's day. Today is Hinamatsuri day and in the morning circle we asked questions like "What day is it today? ", "What do they eat and drink on this day?" and "How do the girls dress?". After this we moved onto the tea ceremony and the kids sang the Hinamatsuri song and then Mrs. Miura and her two assistants helped to make some delicious tea. Julian also dressed in his ceremonial gown and helped serve the tea. Everyone that was involved with the ceremony enjoyed it immensely. Firstly we ate some very sweet candy from Kyoto and then drank the tea which is a little bitter. The sweetness of the candy made it almost impossible to notice the bitterness of the tea and then after this we ate another piece of candy to counteract the bitterness again. I am sure everyone felt refreshed and reinvigorated after drinking the Green tea. After lunch we made a Hinamatsuri calendar for the month of March and the Kinders and Rompers did a great job of assembling the different pieces of the dolls and sticking them onto the paper. Today kids played fun coordination games by using balloons. We raced in pairs as students had to hold them first with their arms and then gradually with more difficult parts of the body (tummy, head, neck, between their legs, etc.). After excersising so hard! they were telling me all the time "I'm hungry! Lunch time?". It was really funny! 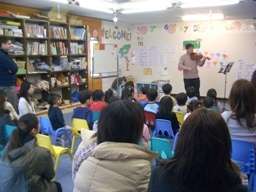 Since one of our themes for February was music, we asked a professional musician to come and play for the children. Mr. Satoshi Inoue of Miharu was kind enough to come and play violin for us. At circle time we talked about how to behave at the concert, and then had an early snack so we could be ready for Mr. Inoue. Some moms and grandmothers also come for concert. The kids enjoyed hearing the violin and singing some songs with the violin. We sang the Tulip Song, and Sanpo (from Tonari no Totoro), and Twinkle Little Star, as well as a couple of others, and we heard a song by Beethovan. The children were enthusiastic and even requested songs for second concert. At the end of the concert, A.Sh. and N.M. gave him flowers and thanked him. After the concert we made Momotaro paper and chopstick puppets so we can act out the Momotaro story with our friends and at home. 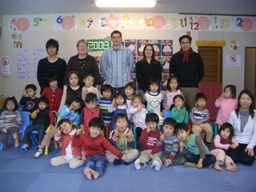 The kids enjoyed coloring and making the puppets, and we sang the Momotaro Song while we worked. After lunch we practiced our Teddy Bear Songs and the handbells for the upcoming concert. The kids really love dancing with their stuffed animals. This morning in the morning circle we started with attendance and the kids had to raise their hands and say "Yes" when the teacher called their names. Next was a guessing game that the kids had to guess which animal puppet was under the puppet stage. Hints were given and then the teacher would slowly reveal the animal if they could not guess the animal. 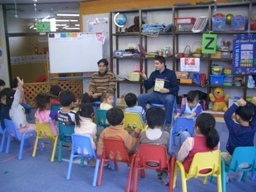 In song time the kids listened to a new "ABC" song which they thoroughly enjoyed. In Romper time the kids did a shapes worksheet. They did an excellent job of listening to the teachers instructions and A.Su. was very vocal in this class and was answering many questions from the teacher correctly. It was pleasing to hear A.Su. contribute more to the morning circle as well because she has a good grasp of English vocabulary. After this the kids enjoyed a ball balancing game and then some soccer with the teachers. Then it was lunchtime and after lunch the some of the kids practiced with handbells for the concert. In the morning circle today the kids studied shapes and we asked them questions like "What shape is this?" and then the teacher drew the shape on the board and continued to draw inside the shape and we then asked the kids "What is this?" and they had to answer "It's a cookie". After this the children listened to a story called "The Tooth Book" by Dr. Seuss which everyone thoroughly enjoyed. In Toddler time A.S. and S.S. were chosen to be the song leaders and did a great job in showing the little kids the actions to the songs. Then in craft time the Toddlers and the Rompers started their Tulip craft. They blew on blobs of paint with a straw to create a beautiful pattern on their paper. After lunch the kids either practiced the Sakura song on the handbells or played with the stilts or played hopscotch before going home. Today we read a story about Valentine's Day and talked about the similarities and differences between Japanese and American Valentine's Day. We discovered that on Valentine's Day in America and Canada, kids make cards to give to their family and friends to say "Thank You" for their love and support throughout the year. Afterwards, during Language Arts class, we practiced writing out names on the backs of our Valentines Cards. And then during craft time, we decorated our cards with pasting, coloring, and stamping. The kids enjoyed making all different kinds of cards in different ways. The Kinders learned about using TO and FROM on letters to indicate the RECIPIENT and the SENDER. And they practiced writing the names of the other students and teachers. On Thursday morning, the kids took turns delivering their Valentine's to the different mailboxes around the classroom. The kids enjoyed playing MAILMAN! Tim had story time with the Toddlers while Jeana read Momotaro with the big kids. Then after snack, we broke into two groups. Tim and the Kinders played a matching letters game while Jeana and the Rompers did their Z pages in the workbook. Some of the Rompers also worked on writing and reading the numbers. After 30 minutes we switched and the Rompers played blocks with the Toddlers while the Kinders practiced reading their numbers. N.M. coached B.J. on writing numbers one to 5, while S.S. coached K.W. on writing numbers one to 10. Both coaches did a great job, and both K.W. and B.J. showed improvement. And A.S. coached A.Sh. on reading and spelling number words one to ten. We are trying to teach the kids how to COACH each other. This gives the kids a chance to help eachother. After table time, Tim led a craft time. We had fun making a SECRET Valentine's present for our moms and dads. Won't our mothers be surprised and pleased! After lunch we enjoyed some free time with the blocks and tanagrams, while some of the kids practiced their ball bouncing skills and some of the big girls "played school and house" with the little ones. In the morning we finished doing our Oni crafts making a Oni hat with a face on it and then making a basket to hold the beans. The anticipation was rising while we waited for the return of the Oni's. Before their imminent return the children listened to a story read by Yuko called "Oni wa soto!" which to my knowledge translates to "Ogre go away!" in English. After recieving their beans which they use to throw at the Oni's the children sat down and Julian read them a story. It was during this story that the Oni's burst into the room and the children sat there stunned for a minute, then they realized what they had to do and started throwing beans at the Oni's to try and make them go away! Some kids were a little shocked and started to cry but some of them were very brave and threw their beans at the Oni's seemingly with little fear of them. Some of them ran into the foyer to see if they could capture a glimpse of who was wearing the Oni costumes once they had departed! After lunch we had a less scary activity which was making a February calendar with a Valentines theme and soon it was the end of an eventful morning. This week has been hard without Rebecca but we are managing. In morning circle we played "Silly Itazura Storytime". Jeana read the "Frosty the Snowman" story but with a difference - she changed parts of the story, and the kids had to shout out "No, Jeana." and give the correct information. For example, at the start the story goes "It was winter vacation and the children were outside playing in the snow." But Jeana read "It was SUMMER vacation and the children were at the beach." 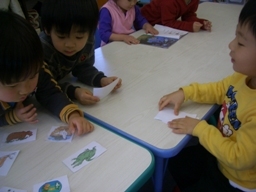 The children quickly caught onto the game and ejoyed changing parts of the story. Our snowman became TIM instead of Frosty and Tim-sensei got to act out parts of our new silly story. After, we learned a new song which is sung to the tune of "You Are My Sunshine". please don't MELT (or take) our snowman away. At snack time, we had a birthday party for B.J., R.I. and A.Sh. Mrs. Kimie made delicious steamed blueberry and yogurt cakes. They were delicious. After Circle and Storytime we had language arts. The children did the "Y" pages in their workbooks, then wrote a PICTURE STORY about something special they can do. "I can......"
From this week, on Wednesdays the Rompers and Kinders will take turns helping Tim with Toddlers. This morning in the morning routine we studied "Y" vocabulary like Yard,Yan,Yarn,Yell,Yo-Yo and then we studied some food vocabulary by giving the kids hints and they had to guess the name of the food. After this we had a "Y" story called "Yummy Yucky" and asked them questions like "What flavour could a red soup be?" to really test their knowledge. In Romper time the kids had to do a matching exercise worksheet. They had to match the parent animal to its baby, for example they had to match a Horse to a Foal. 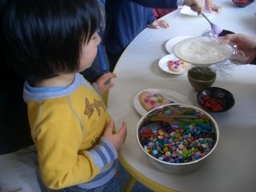 The Toddlers played a game which was to put all of the same coloured balls into a basket. They had a lot of fun and attempted to put all of the colours into the one basket which they finally achieved. Just before lunch we played balloon volleyball which was lots of fun! After lunch we made birthday cards for R.I. and then just before hometime we read a story called "Where can Bunny paint?" In the morning we played guess the food. The flash card were described to the students and they had to guess what food was on the card. We reviewed some of the occupation flash cards from before. Some of the students had a hard time making up their minds on what they wanted to be when they grow up, they wanted to do everything! We finished morning circle with "Peter's chair". A story about a boy who learns how to share his things with his new baby sister. During language arts we read the story "winter time". A rhyming book about the different parts needed to build a snowman. Then in craft time we made our own snowman out of circles, squares, rectangles and a triangle for a nose. Before lunch Yuko explained to the students in Japanese the correct way to take care of our books. In the afternoon we finished our Daruma Otoshi by drawing serious faces on them. The good-bye story was "The jacket I wear in the snow". In the morning routine we studied "X" vocabulary and then we had a story called "I'll be a Firefighter" which then led to the next activity which was learning about occupation vocabulary, for example, Nurse, Singer, Doctor, Model ...Etc.. . I then asked the question "What do you want to be when you are older?" and they had to reply "I want to be a _______". Most of the students wanted to be Singers! Later in Japanese time Yuko read a story called "Niwatori Naze Naze Asa Nakuno?" which they enjoyed immensely. After this the students attempted to do an obstacle course. A.S. really excelled at this as she was very fast and could beat the timer. After lunch the students made birthday carsds for B.J. and some of the kids finished making their Daruma Otoshi. At 1.50pm Rebecca read a story called "The Big Snowball". wasp, whale, wolf.... などみんな答えを当てていましたが、wagon の時はなかなか正解が出ませんでした。そのとき、トドラーのR.O.ちゃんが答えを当て、先生達みんなビックリ！！R.O.ちゃん、初めてステッカーをゲットしました。Good job!! It was a very cold morning, so we kept the kids busy with balls and hula-hoops this morning. The children have become very good at sharing the balls and toys (with a little encouragement from the sticker fairy). The children are also helping out more and more in the classroom. This morning N.S. was Jeana's sticker helper, and K.W. and U.Y. and B.J. helped Rebecca set up the chairs for morning circle. In morning circle, Rebecca reviewed the "W" words, and read the OPPOSITES book. While reading the story, the kids practiced TALL AND SHORT by comparing sizes. "H.W. is taller than H.I." etc. "A.Sh. is shorter than N.M." etc. We danced and sang to "Are you Ready?" and "Five Little Ducks" and some other songs. After circle time, the kids enjoyed chatting about "Dangerous" things while eating their snacks, and we read our "OUT" books during language arts. Then the kids made a cool racket and birdie for Japanese badminton(Hanetsuki). We had a very fun day together today.